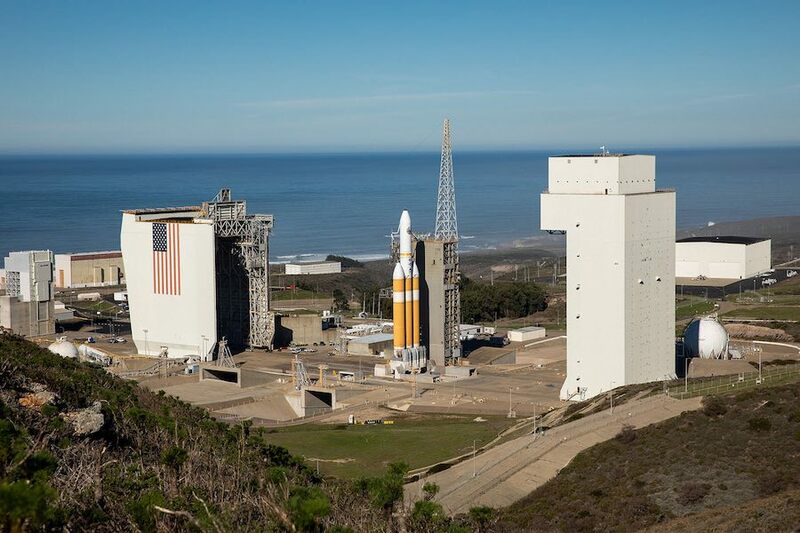 Liftoff of the Delta 4-Heavy, the largest vehicle in ULA’s rocket fleet, is scheduled for 11:05 a.m. PST (2:05 p.m. EST; 1905 GMT) Saturday from Space Launch Complex-6 at Vandenberg Air Force Base, a military installation around 140 miles (225 kilometers) northeast of Los Angeles. There is a 70 percent chance of favorable weather conditions for the launch, and forecasters predict the only weather concern during the countdown will be ground winds. The weather forecast worsens Sunday, when there is just a 40 percent chance of acceptable conditions for liftoff. Saturday’s countdown is set to begin eight-and-a-half hours before liftoff with power-up of the Delta 4-Heavy’s flight computer, followed by testing and checkouts of the guidance and flight control systems. 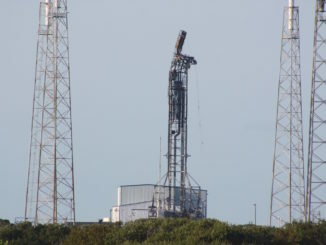 The mobile gantry at the SLC-6 launch pad will be retracted to reveal the 233-foot-tall (71-meter) Delta 4-Heavy, and ULA’s launch team will oversee the loading of around 465,000 gallons of cryogenic liquid hydrogen and liquid oxygen propellants into the rocket’s three first stage boosters and upper stage. After a final poll of the launch team during a built-in hold at T-minus 4 minutes, the countdown will tick down to launch, with the staggered one-by-one ignition of the Delta 4-Heavy’s three Aerojet Rocketdyne RS-68A main engines set to begin at T-minus 7 seconds. After a health check of the engines, the Delta 4-Heavy will climb away from SLC-6 and head southeast over the Pacific Ocean, following a path roughly parallel to the coast of Southern California. The payload launching Saturday is top secret, but it is owned by the National Reconnaissance Office, the U.S. government’s spy satellite agency. The mission is codenamed NROL-71. 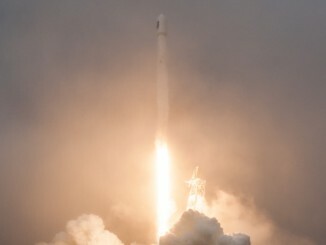 Outside observers believe the payload is likely a very high-resolution imaging satellite with an Earth-facing telescope built to collect sharp pictures of strategic sites, battlefields and other targets around the world. ULA attempted to launch the Delta 4-Heavy rocket on four occasions in December, beginning with a Dec. 7 launch attempt officials called off to investigate a glitch in the the holdfire system that would allow safety officers to abort a liftoff. On Dec. 8, the Delta 4’s automatic countdown sequencer halted the clock at T-minus 7.5 seconds, just before the rocket’s three RS-68A main engines were supposed to ignite. Engineers blamed the Dec. 8 abort on “an intermittent signal from a bad monitor (that) caused an automated hold to be triggered,” wrote Tory Bruno, ULA’s chief executive, on Twitter. ULA tried again to launch the Delta 4-Heavy rocket Dec. 18, but gusty winds thwarted that launch attempt. Managers scrubbed the next try Dec. 19 after sensors detected elevated concentrations of hydrogen around the engine section on the launcher’s port-side booster after fueling the Delta 4-Heavy with cryogenic liquid propellants. ULA’s launch team conducted two tanking tests on the Delta 4-Heavy on Jan. 3 and Jan. 12 to troubleshoot the hydrogen leak, and technicians removed and replaced a valve to resolve the issue, according to Julie Arnold, a company spokesperson. The launch company — formed in 2006 by the merger of Boeing and Lockheed Martin rocket operations — conducted eight launches last year, all successful. ULA’s 2018 flight record included five Atlas 5s, two Delta 4s and a Delta 2. ULA’s rockets blasted off from Cape Canaveral five times in 2018, and from Vandenberg three times, including the launches of two major NASA science missions — the InSight lander to Mars on May 5 on an Atlas 5 from California, and the Parker Solar Probe on Aug. 12 aboard a Delta 4-Heavy from Florida. The final flight of the venerable Delta 2 rocket Sept. 15 from Vandenberg lofted NASA’s ICESat 2 Earth observation satellite to track changes in polar ice and sea ice. Up to seven missions are planned by ULA in 2019, one fewer than the company accomplished in 2018 as Air Force and NASA launch activity is expected to wane this year. The manifest is highlighted by the company’s first launch with human passengers. After the Delta 4-Heavy’s launch Saturday, the next ULA flight is scheduled for March with the U.S. Air Force’s 10th Wideband Global SATCOM communications satellite, according to an Air Force spokesperson. The Boeing-built WGS 10 satellite will launch from Cape Canaveral, flying a variant of the Delta 4 with a single first stage booster and four strap-on solid rocket motors. Later in the spring, an Atlas 5 rocket is scheduled to launch from Florida’s Space Coast with the first Boeing CST-100 Starliner spacecraft on an unpiloted test flight to the International Space Station. The CST-100 Starliner is one of two commercial crew capsules funded by NASA, alongside SpaceX’s Crew Dragon, to ferry astronauts to and from the space station. Assuming the test flight without astronauts goes well, another Atlas 5 rocket will launch with a three-person team of Boeing and NASA astronauts on a following CST-100 Starliner spacecraft later this year, perhaps as soon as August. SpaceX aims to conduct its crew capsule tests flights — first without a crew and then with astronauts — no earlier than February and June. Atlas 5s carrying Boeing’s crew capsules into orbit will feature two solid rocket boosters to give the rocket extra thrust. 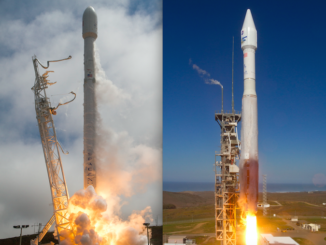 Amid the commercial crew launch campaigns, ULA has two other missions planned this summer. An Atlas 5 rocket fitted with five strap-on solid-fueled boosters is set to add a fifth Lockheed Martin-built Advanced Extremely High Frequency communications satellite to the Air Force’s network of ultra-secure, nuclear-hardened voice, video and data relay satellites with a launch from Cape Canaveral scheduled no earlier than June 27. In July, a Delta 4 rocket is expected to lift off with the Air Force’s second new-generation GPS navigation satellite, following the debut launch of the military’s latest series of GPS satellites aboard a SpaceX Falcon 9 rocket Dec. 23. The July mission by the Delta 4 rocket will mark the final launch of the Delta 4’s “single stick” version, which ULA is retiring in favor of the less expensive Atlas 5 family, and eventually the next-generation Vulcan rocket set for an inaugural mission in 2021. 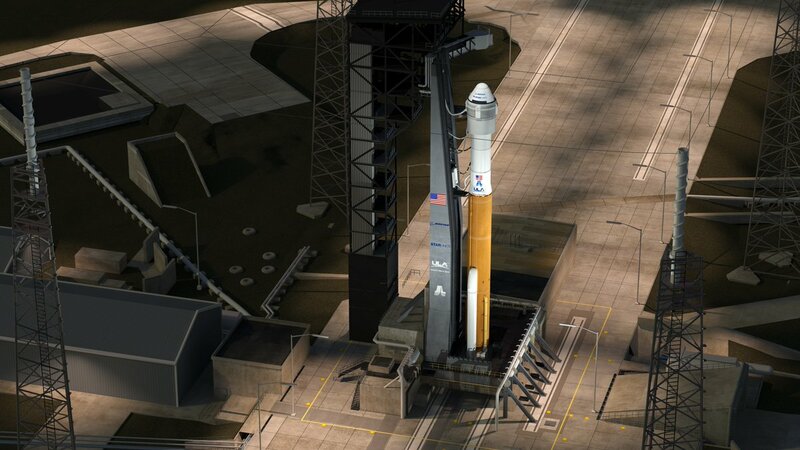 The more powerful Delta 4-Heavy will remain in service through at least the early 2020s. One more Atlas 5 launch is planned to round out the year, likely carrying one of the Air Force’s reusable X-37B space planes into orbit from Cape Canaveral. The X-37B, also called the Orbital Test Vehicle, launches vertically on a rocket but lands on a runway like a miniature space shuttle. The X-37B, manufactured by Boeing, does not carry a crew, but it can accommodate technological experiments, scientific payloads and even small satellites in its cargo bay. The Air Force typically does not disclose details of the X-37B’s missions. Five X-37B missions have been launched since the vehicle’s first orbital flight in 2010. The Air Force has two of the space planes in its inventory, and one of the vehicles is currently in orbit after launching in September 2017 on a Falcon 9 rocket. The program’s next launch is scheduled as soon as December, but an Air Force spokesperson suggested the mission could be delayed to early 2020.